We'd like to introduce you to Mowat Electrical and our team. In February 2007, Steve and Lisa Mowat began a new endeavor by starting their own electrical business. 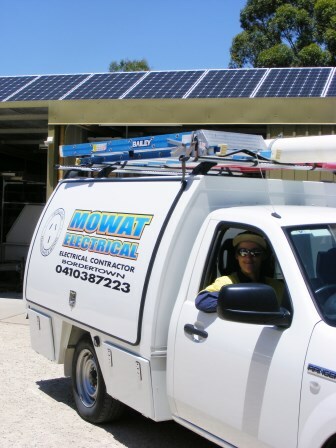 Since then Mowat Electrical has been steadily growing its valuable customer base and offering quality electrical services to Bordertown and the surrounding areas of the South East. Mowat Electrical is a family owned and run business which we find helps keep the service more personal for our customers; this also assists us in getting to know customers more closely which improves our ability to cater to their electrical needs. As an independent business in Bordertown, we understand the need for local support which is why we like to source products locally when possible. We also understand customers want reliable and functional products which is the reason we choose to use and supply quality and trusted electrical brands to ensure customer satisfaction. Our father and son team of electricians have been working together since December 2009 when Billy Mowat joined the business; such a long working relationship allows them to work efficiently and ensure jobs are completed to the best possible standards. Throughout the years Lisa has been doing the administration work for the business and taking care of the office. Lisa now shares that task with Corinne Brookes who has joined the Mowat Electrical family and steps in during busy periods to assist with the work load. We're here to help you! All electrical needs can be taken care of any time of day or night! Please contact us and we would love to be of assistance. Steve Mowat - Owner, Manager and Qualified Electrician (Since 2007). Lisa Mowat - Administration (Since 2007). Corinne Brookes - Administration (Intermittently Since 2012).